This is a large project led by Huw Lewis (UK Met Office) dealing with land surface responses to climate change. My role is to coordinate CEH's involvement in UKEP and to deliver improvements to the JULES operational prediction model, working with Eleanor Blyth and Nick Reynard (on the UKEP Advisory Panel). Currently, I'm working on modifying the JULES River Flow Model (RFM) to include the process of overbank inundation, which is, basically, local-scale fluvial flooding. 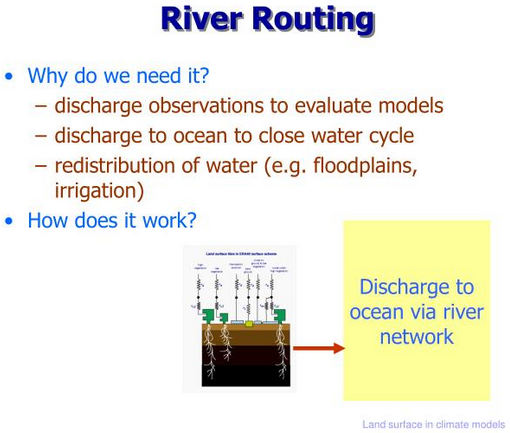 Without this, modelled water courses in RFM cannot overflow their banks and inundate the surrounding landscape to form fluvial wetlands. Overbank inundation is generally implemented in fine-scale flood prediction models (e.g. CaMa-Flood, LISFLOOD), but has never (to my knowledge) been implemented in a global-scale land surface model before our project activities. My work on this is partly under the umbrella of the UKEP project (also see TWIKI), with the Hydro-JULES project covering related aspects. 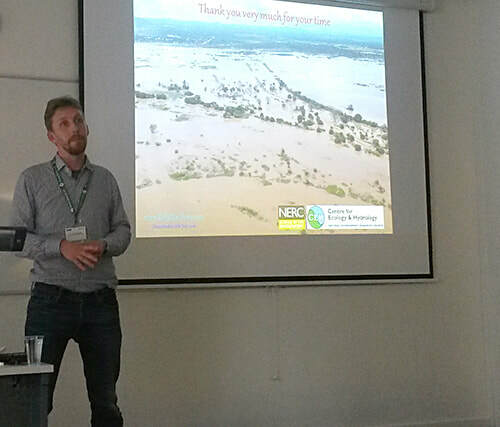 In July 2016 I gave a summary talk at the RMetSoc conference "High impact weather in a changing climate" in Manchester (see here). 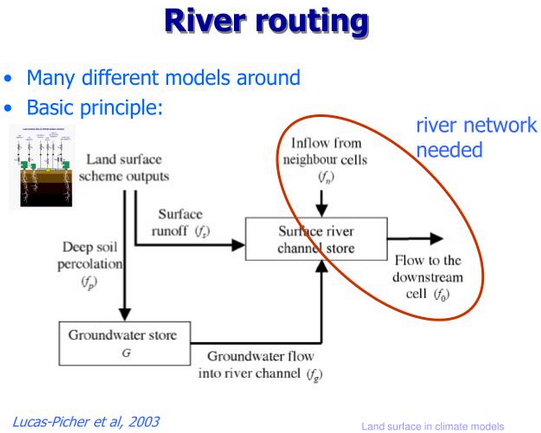 For me, the most accessible 'explainer' for what river routing means is this one from van den Hurk, summarised in the two diagrams below. The overbank inundation bit is nothing more or less than including the dynamics of floodplains, i.e. the spread of the river channel when it is in flood (see image from here further below). For information about how this is done in the JULES framework, see the jules_rivers manual page. The implementation of overbank inundation I'm working on is based on Simon Dadson's overbank inundation code from 2005-08 (see Dadson et al. 2010 or this earlier poster by Ian Ashpole). For a summary of the work, see Simon Dadson's presentation here, Lewis et al. (2018) and the minutes of our meeting 25th January 2017 in Oxford here. This went into the JULES code at vn5.1 in early 2018, so now we are on to improving the code in various ways to bring it in line with current hydrological theory: see here and here (both require Met Office login) and exploring implementation of other options, e.g. using CaMa-Flood directly (in collaboration with Dai Yamazaki at JAMSTEC). Here is my presentation about this at the JULES meeting in Exeter, 27th June 2017: PDF.